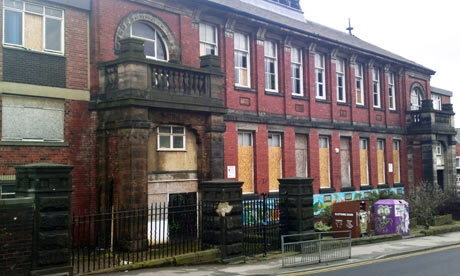 It looks like the bulldozers are moving in on the old Royal Park Primary school a week on Monday (3rd February). Built in 1892, the former school in the Hyde Park area of Leeds has stood empty for nearly ten years, and for most of that time its future has been the subject of heated debate – with successive bids by campaigners to turn it into a “community hub” either failing to source sufficient funds or being turned down by Leeds City Council. In July last year council leaders gave the campaign group, the Royal Park Community Consortium, “one last chance” to come up with a viable plan for the building’s future, but after three months decided the latest proposals were not “robust” enough. A last-ditch appeal by campaigners a month ago for a further reprieve appears to have fallen on deaf ears. A decision published today on the council’s website says demolition work will start on 3rd February and be completed by 25th April. It says the building is in a poor condition and at risk from “further break-ins, theft, vandalism, anti-social behaviour and arson attack”. “Demolition of these premises will reduce the Councils on-going maintenance costs, will remove the Councils liability for empty business rates and will reduce the Councils risk in respect of Health and Safety,” it adds. Once the demolition is done the site will be grassed over “until a deliverable primarily public sector, affordable housing or community use is brought forward”. 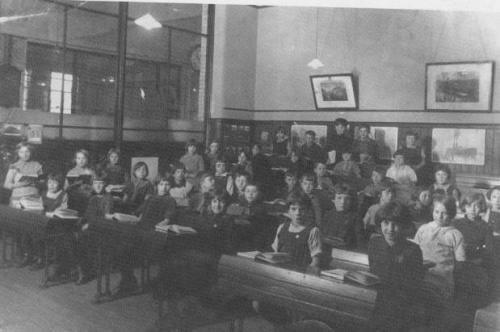 There’s an interesting account of the school’s history and the campaign to save the building (up to 2011) here. Worth a read. Worth checking out too are John Baron’s full accounts of the campaign when he was running the Guardian’s Leeds blog. 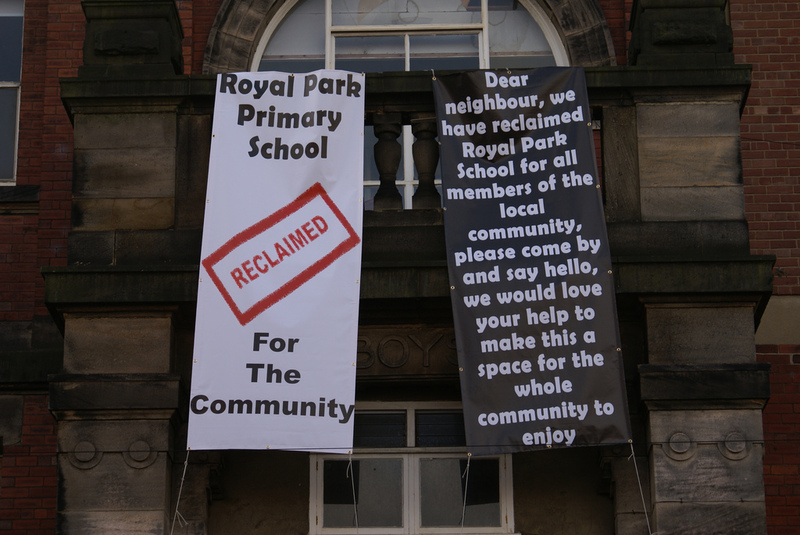 In 2009 campaigners temporarily squatted the building – you’ll have seen it across the road if you’ve ever been to the Brudenell Social Club or the Royal Park pub – “reclaiming” it for the community. It’s a much loved building. What a shame. This entry was posted in Uncategorized and tagged leeds, leeds city council, royal park community consortium, royal park primary. Bookmark the permalink. Royal park school means lots to the community around here and it could easily be converted into town houses or even flats with only minor demolition! But no this is the council council looking for the quickest and easiest way out as usual! Lcc you should be ashamed and you are not fit to govern us!!!!! Yes they clearly took the quickest way out given they spent 10 YEARS (!!!) trying to find a viable way to save the building …. Trying to find a viable way to save the building? Leeds City Council and ‘Asset Management’ have done no such thing. The Community of Hyde Park has tried to find a viable way to save the building but have been met by obstacles from LCC all the way. In the early days before the damage to the roof (which was suspicious in itself) the Council could have handed the building over on a ‘peppercorn’ rate so at least the building was being used. Were they interested? No. It is criminal neglect on behalf of ‘Asset Management’ and Leeds City Council. They have intentionally left the building to rot to present demolition as the only viable option. If this is not the case then why did they do nothing about the damage to the roof when they were alerted to it by the local community back in 2009? After the building was occupied in 2009 Leeds City Council went to the lengths of evicting and pursuing people through the courts – people who had given up their time, money and good will to repair a building they could see was being neglected. Obviously they were interfering in the planned schedule of managed decline. With a damaged roof of course repairs costs were going to escalate. If they had at any point been serious about ‘retaining’ the building they would have done something about this damage and jumped at the offers of help from local businesses and locals. Remember when this building was closed as a school in 2004 it was in a perfectly habitable condition. You’re right. It does look like (mis)managed neglect and decline. The scary thing is that they genuinely believe demolition represents progress for people living in the Royal Park area.